Well, yet again Edinburgh appears to have impressed the people who compile such international surveys. Our home city is now considered to be one of those cities you should see before you die! 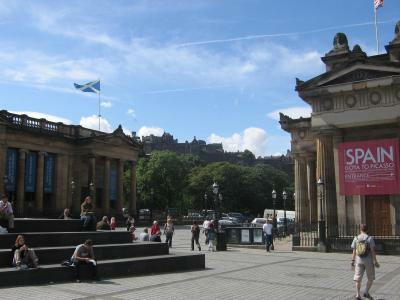 It's certainly no surprise that Edinburgh scored so highly; leisure and entertainment rate very highly, especially in the summer, and not only because of our record-breaking International Festival & Fringe. It is also true to say it's a city that has the best of everything; historic buildings, great atmosphere, vibrant leisure and retail offerings, abundant green spaces, outstanding schools and universities as well as our own set of international societies. I heard last week we have more than 30,000 Polish living in Scotland (many of them here), as well as over 5,000 Chinese, mostly students. That's not all, there's also a small but active Japanese community here too. Our National Galleries, small compared to other national collections, is nevertheless among the world's best and is housed in five different galleries around the city. Over this summer, there has been a spectacular celebration of Spanish art and culture at the main complex in the heart of the city. It really is well worth seeing. "The Discovery of Spain-Goya to Picasso" is an exhibition of works by Spain's great artists as well as by English and Scottish artists inspired by their experiences of Spain at that time and after. All works are taken from British collections created over the years since Spain once again became an object of interest in British society. This occurred from the very end of the 18th century to the present day after centuries of obscurity and avoidance. One of my favourite beaches in the Edinburgh area is in St Andrews, about an hour's drive from our house in Colinton. St Andrews is more well-known for its university and golf links perhaps but this beach is central and features large in the life there. I wonder if anyone knows that this beach features prominently in the opening credits of the Oscar winning movie, "Chariots of Fire"? It won four Oscars, including Best Picture, in 1981and opens with a group of athletes in training under a lowering sky, running along sands through breaking surf. The camera pans along the whole stretch of the beach from the dunes above it and, as Vangelis' oscar-winning music expands its theme, the scene zooms in as they pass by. One gets a great view, an iconic imagine of St Andrews' spires and rooftops set high above the horizon, before the titles are complete, the music fades and the movie gets going. 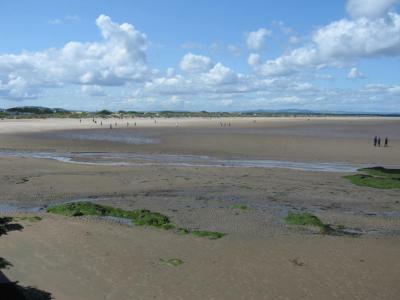 The beach is a favourite for student joggers, dogwalkers and lovers with golfers busy over their play in the foreground. It's the absolute epitomy of my perfect beach...I love it. Summer is now offically over here and indeed the days are noticably shorter, with it getting dark now around 8:00pm. Dry leaves fly in the winds that carry a distinct smell of Autumn. Conkers are on the trees too, but perhaps the biggest sign of seasonal change is the heather in full colour. Our garden has a good-sized bush of heather, grown from just a sprig, which is now in flower. There are many varieties and colours of heather and this one is white; it was presented to us by an old friend of Kayoko's after her first visit. White heather, as a gift, is a sign of love, best wishes and good luck. We always think of Tomi, our friend in Nagoya who gave it to us, when we see it in full bloom. 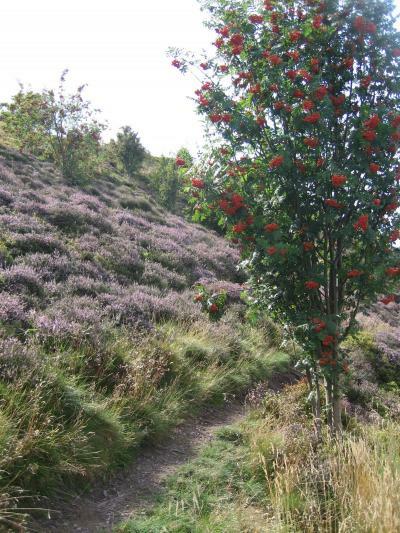 The picture os not of our heather but a shot of a hillside behind where we live; the small tree on the right of the photo is a Rowan or, as it is more often called south of the border, in England, a Mountain Ash. It is the national tree of Scotland much as the tree of Japan is the Cherry. One finds the Rowan in many gardens in Scotland, including ours, and it shows delicate white flowers in Spring and then bright red berries in Autumn. It's not a very big tree but it is perfect for bringing colour to the garden in Spring, Summer and Autumn.